Thanks to the results from action at the World Cup earlier today, the first two Round of 16 matches have now been set - Brazil vs Chile, as well as the Netherlands vs Mexico. 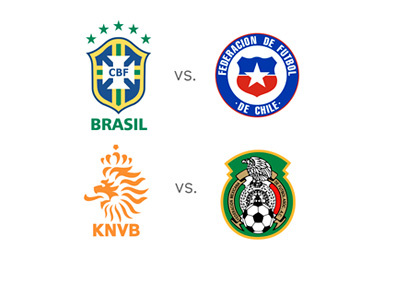 Brazil vs Chile is set for Saturday, June 28th, while the Netherlands vs Mexico is going to take place on Sunday, June 29th. Chile has been one of the more surprising stories of the tournament, as they managed to beat both Spain and Australia in their group. The win over Spain was particularly jarring for the football world, as it meant that the Spanish club, who are the defending champions of the World Cup, wouldn't be making it out of the Group Stage. Chile, though, is going to be matching up against the host nation in Brazil - a host nation that seems to have found its confidence once again following a draw against Mexico in the Group stage. Neymar looks superior right now and the Chilean side will have a very tough time defending against all of Brazil's weapons. The Netherlands, on the other hand, finished Group B play with a perfect 3-0-0 record. The team, which was not considered to be one of the favourites to win the tournament prior to the World Cup getting underway, smashed Spain 5-1 in their opening match and have been cruising ever since. It's important to note that the Netherlands has a very talented squad that went to the finals in 2010. Mexico finished 2-1-0 in Group A play and managed to advance to the knockout stage following a 3-1 victory over Croatia earlier today. Mexico is going to have a very tough match in the Netherlands, but the Mexican squad will have nothing to lose, which makes them a dangerous foe. The odds for the Brazil/Chile and Netherlands/Mexico matches haven't been released as of yet, but you can safely assume that the two Group winners will open as heavy favourites.